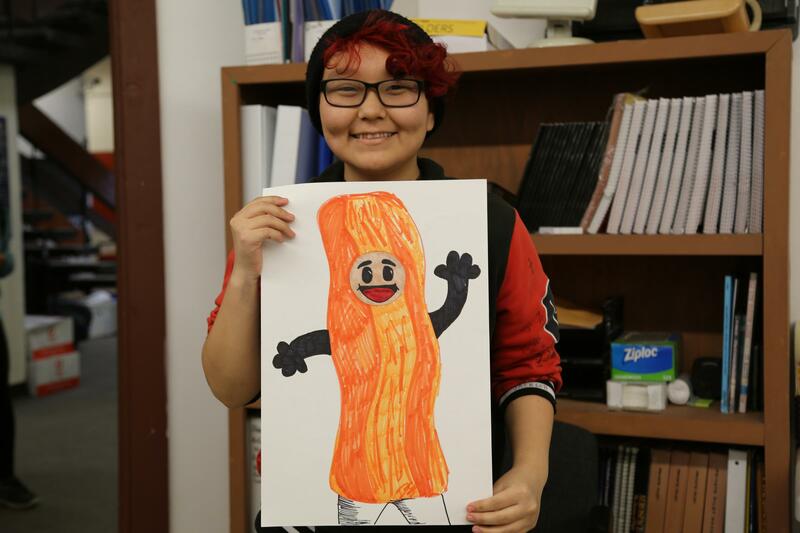 LKSD student Dorothy Jackson from Nightmute shows her Halloween costume design for a salmon strip that looks like bacon. In Toksook Bay, the Nelson Island high school seniors will be sponsoring a city league basketball tournament starting on Friday, October 5. Anyone can sign up to play. It will cost $20 per person to compete, and you must sign up with a team. If you would like to attend, it is only $2 to watch one game or $5 to watch all day. Eek is hosting a Halloween Carnival this Saturday. There will be games, a haunted house, a costume contest, and concessions. The student government will be posting additional information on flyers that will be hung around the village and posted on Facebook. 1. Matching skeleton costumes that make kids think they don’t have a body. 2. A minion from the movie, but like, really big! 3. A salmon strip that might look like bacon. There will be a Mix Six Volleyball Tournament this weekend in Bethel. Teams from all around our region will be flying in to compete at Bethel Regional High School. The games will start on Friday night at 5 p.m. and go into the evening. The games will then pick back up on Saturday at 9 a.m. and go until the winner is decided! This was Lucilia, Kaylee, Dorothy, and Katya, and that’s what it is at LKSD. “What It Is At LKSD” is a weekly roundup of events happening throughout the Lower Kuskokwim School District. This week's episode is brought to you by LKSD Media Ready Students Lucilia Angaiak of Tununak, Dorothy Jackson of Nightmute, Katya John of Tuntutuliak, and Kaylee King of Mekoryuk. The students are attending Bethel Regional High School this semester as Media Ready students.